To get the artwork to print on the shirt we first need to make color seperation of each print and print each color on a film. Traceing paper film we only use if the artwork is in one color and smaller then A4 and if we are in a hurry. As tracing paper dont age well. Then we put on a kemical on the screens that will dry when its dryed in our ligth box. Then we put the film on the ligthbox and the screen ontop. After about 10 minutes we turn off the ligth and let the screen dry. When the screen is dryed up we clean the screens up so where the artwork film was on the screen the silk pores open up so when we silk screen later the ink color of the artwork comes out. For our sewing, its all about having good staff. A sewing machine can be old and still sew better then a new machine its really its all depending finding good staff that knows their way around a the sewing machines they use. But paramount to all aspects of this business, the magic happens in the sewing threads. I cant tell you how many times I got a shirt and the fabric and print lasted longer the the sewing threads. 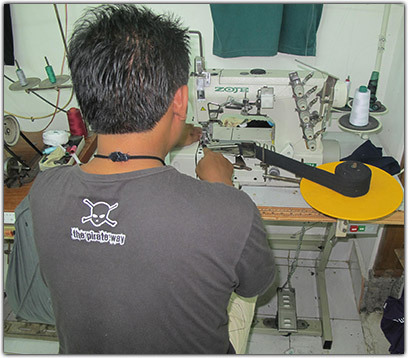 So we institute a Yamalon polyester thread that is the best available here in Indonesia. Same for our Zippers we always use YKK zippers to be sure that we produce something that holds up to international standards. With indoor sewing technicians, we keep all our machinery running at top efficiency with up to date and with the highest quality codes and standards. To keep track on all productions and products we have a barcode system in place and this system follows each item through all around the factory. From the design of the order we produce a code for each product, this same item identification number is assigned to the product from start to finish.